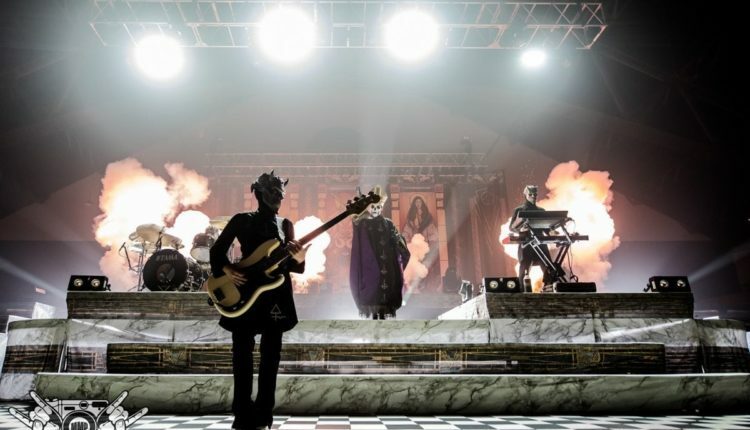 Ghost is back on the road once again and is giving fans their biggest show yet. The Swedish metal group, lead by Papa Emeritus III, kicked off their Popestar Tour Friday, September 16 in Rochester, NY. The show was held at the Main Street Armory which was home for a few days while the band worked out the kinks in the new production they were debuting for the first time ever. The show was kicked off by the duo that goes by Zombi. It was a synth set that kept fans occupied while they waited patiently to see the debut of Ghost’s new production. Everyone knew it was time for Ghost when the lights dimmed and their signature entrance music “Masked Ball” played over the house speakers. To coincide with their new release, the Popestar EP which hit shelves that day, Ghost opened up the night with “Square Hammer.” Fans in Rochester were the lucky ones who got to see the new single performed live for the first time ever. 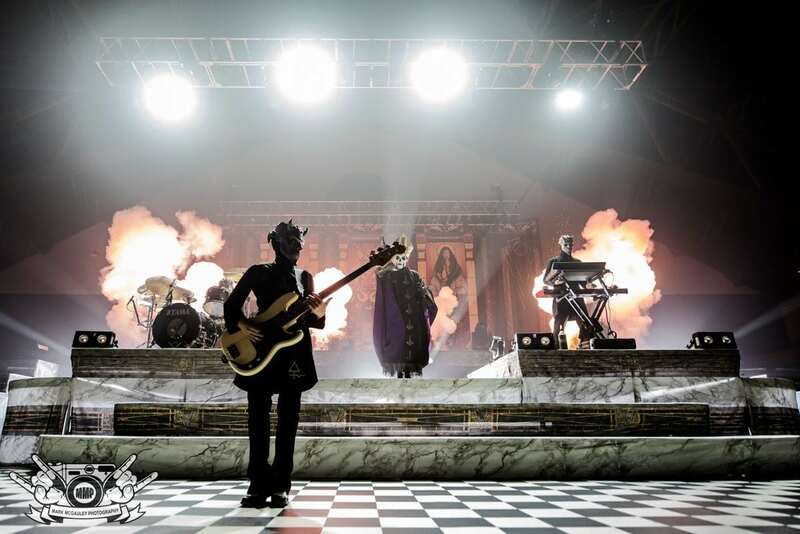 Together with a new stage setup, which featured a trippy looking black and white checkerboard floor, Ghost was full of surprises all night long. It didn’t take long Friday night for fans to realize something besides the production was different on the stage. Although the Nameless Ghouls’ identities are kept secret, there was an apparent change in the band. As rumors sparked throughout the room and comments flooded live Facebook streams, it was confirmed that the Ghoul who goes by Omega had been replaced. Sadly, Omega, who was one of the original members of the band, was not in Rochester and would not be with the band on this tour. It remains unconfirmed whether or not Omega is gone for good, but he was certainly missed Friday night. With Omega’s departure, it’s with open arms that fans of Ghost welcome a new member. This new member is handling bass duties for the band and the original bassist, Water, has taken over the second guitarist role. Any fan of Ghost could easily identify Water as the Ghoul who was taking over Omega’s role. What fans couldn’t answer though was, “Who’s the new bass player?” The new bass player is certainly a tiny one, which leads many to believe that the new member is indeed a female. This tiny Ghoul, who rocks the red nail polish, seemed a bit nervous on stage at first but warmed up throughout the set. To help confirm the rumors about the new Ghoul, she used a black guitar pick that had a pink symbol for Water. Overall, for her first show, the new Ghoul did a great job in the Water role. Original Water, who’s now playing as Omega, was outstanding. As Papa Emeritus III said in previous shows when he introduced Water on the bass, he plays a mean guitar. Once fans realized there were new faces behind the masks and processed that Omega wasn’t there, they were able to appreciate the new production the band brought. This time around, Ghost had pyro, CO2 cannons, and confetti cannons. 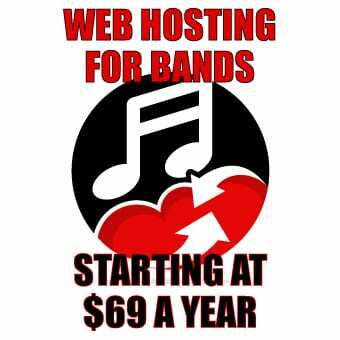 Throughout the night, these added bonuses would pop up and give Ghost’s live show an added punch. Songs like “Square Hammer,” “From The Pinnacle To The Pit,” “Year Zero,” and a few others featured those new added bonuses. Papa Emeritus III, the front man of Ghost, engaged the crowd all throughout the night. He took a poll of where the crowd came from and it seemed like Buffalo was the clear winner. Other cities Papa mentioned were Niagara Falls, Syracuse, Albany, and obviously Rochester. One of the best things about seeing Ghost live is the humor of Papa Emeritus III. It’s almost impossible to go see a Ghost show without laughing once. The night came to a close in typical Ghost fashion. The song, “Monstrance Clock,” has been Ghost’s go to song to end shows for quite some time. For anyone who hasn’t had the chance to see Ghost yet, this tour is the one to certainly check out. The Popestar Tour runs all the way through October and wraps up in Brooklyn, NY on November 12. From now until November, the Ghost will make their way all across the United States and select cities in Canada.